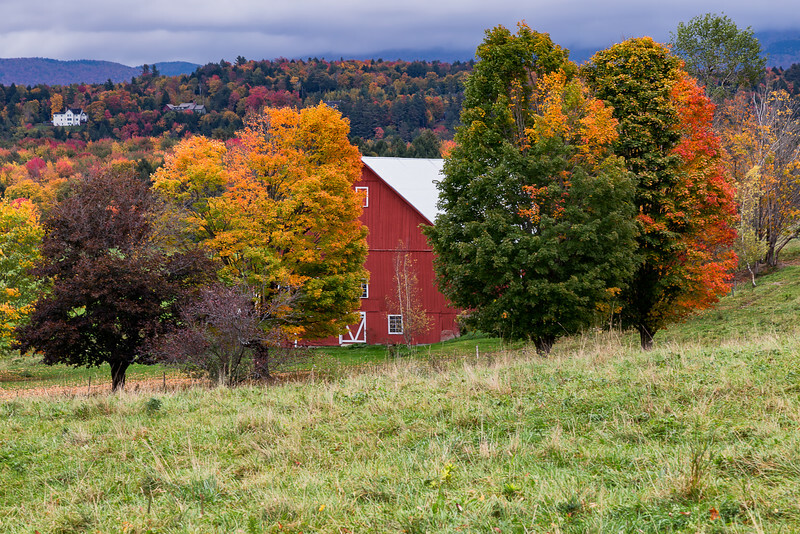 Waterfalls, covered bridges, old red barns, rustic towns, and a dazzling array of colorful foliage at every turn - Vermont in the fall is a feast for the senses and is the epicenter for a peculiar type of tourist: the Leaf Peeper. 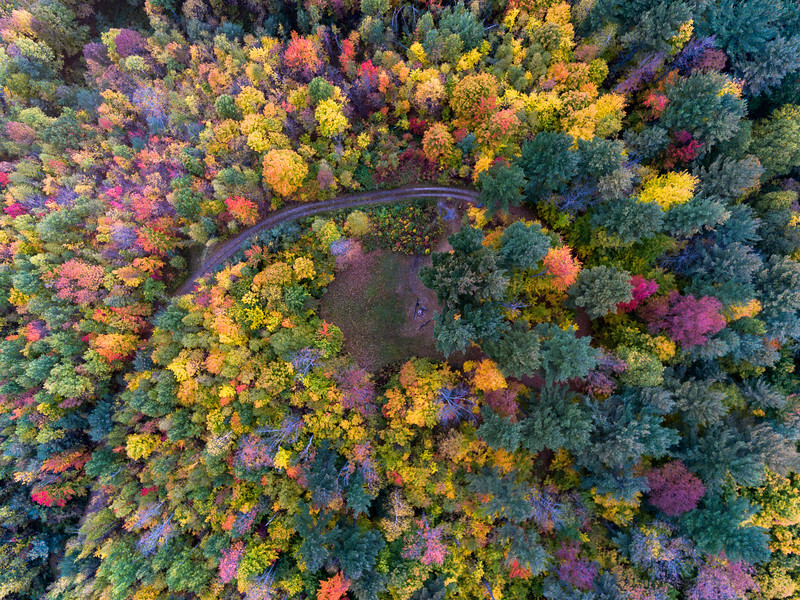 Leaf Peeping is not for the faint of heart. The world moves fast and our lives are a constant binary bombardment of 1's and 0's appearing on our phones at the speed of light, disguised as happiness. The art of appreciating the fall foliage is an exercise in solitude. It requires quieting the mind and filtering out the noise to properly enjoy Nature's endless palette. 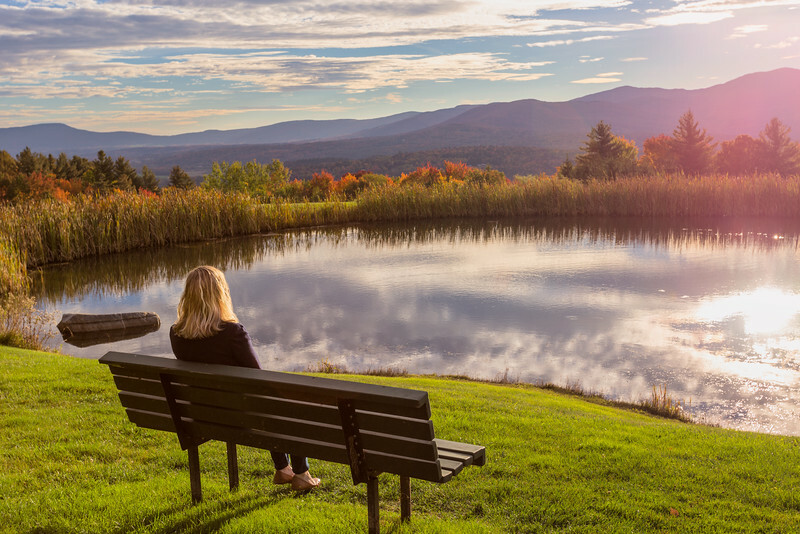 The search for this pastoral way of life brought my wife and I to Stowe. 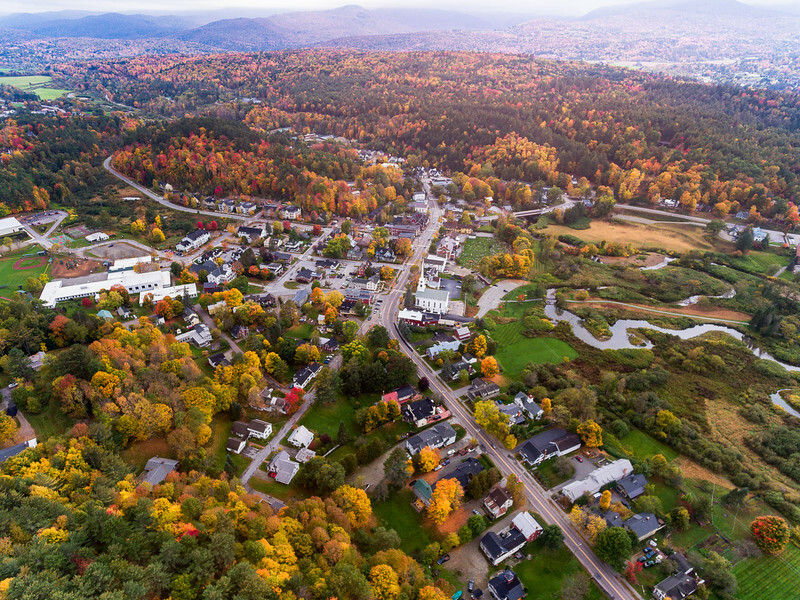 The town of Stowe is the quintessential autumn getaway destination. It was brought into prominence by the von Trapp family (yes that von Trapp family) who moved to Vermont after fleeing the Nazis in 1938. 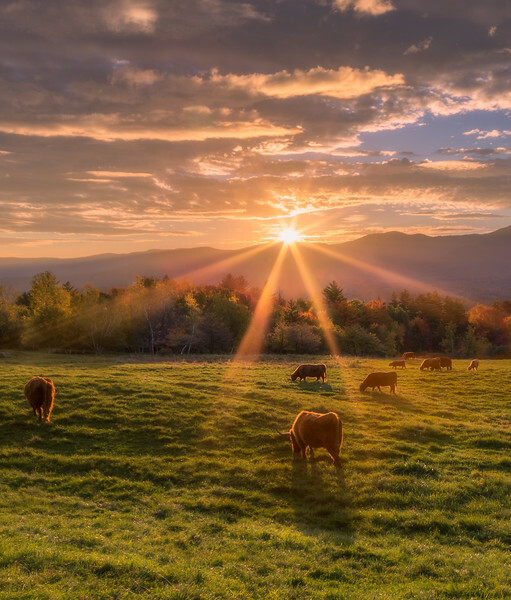 Their property, the Trapp Family Lodge, is nestled in a valley at the foot of the Green Mountains on 2500 acres of pristine land. We live in Houston, Texas where the four seasons can best be categorized as Hot, Hotter, Broiling, and December. While Houston is an amazing city to live in, I have never had the pleasure of experiencing true seasonal changes. Escaping the 95 degree heat to the crisp Vermont air was a treat. Visions of reds, golds, oranges, magentas, and pinks danced in my head. 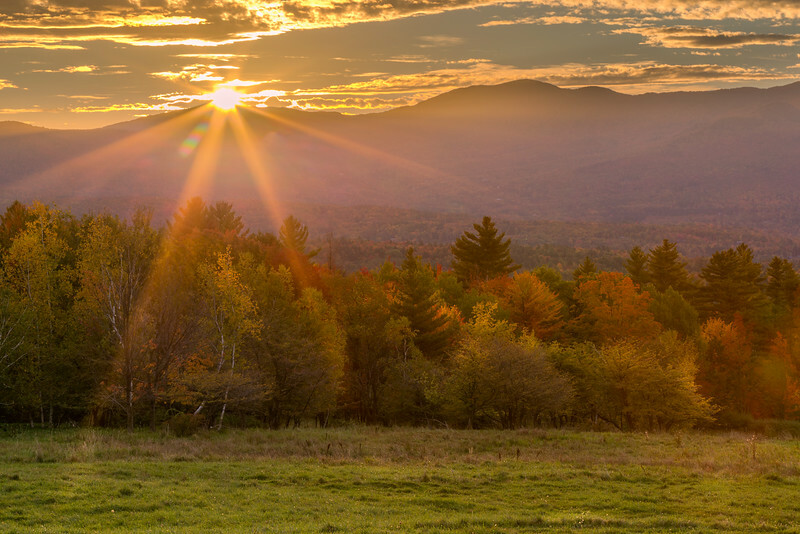 Armed with a jacket and a camera, I was ready for a perfect day of leaf peeping. My story begins as all great travel photography stories should begin: at sunrise. In my experience, it isn't the rooster's crow that anticipates the coming of the sun, but rather the clouds that herald the new day. On our first morning in Stowe, we noticed pinks and reds starting to tinge the clouds before dawn, building momentum until finally culminating in a golden avalanche of light as the first rays of the sun crested above the mountains. It was a pleasure spending the morning outdoors, enjoying the views without being tethered to my phone, buried in a ever-growing pile of emails. In the image above, I used a small aperture of f/16 to showcase a starburst effect as the sun first came into view above the mountain range. The sun rays dripping over the foreground highlighted some of the trees and provided added depth to the scene. The landscape dramatically changed before our eyes as soft light poured into the valley, enhancing the already vibrant colors and providing a vivid counterpoint to the cool, dark atmosphere that had been present just moments ago. A young bull meandered over to me and posed stoically for my camera, the trees glimmering behind him. I snapped a few shots (freezing him in place with a fast shutter speed) and slowly walked away, leaving him in peace to his morning grazing. You don't need coffee when you can start your day like this! After a great early morning of cattle portrait photography, we decided to wander aimlessly, letting the colors guide us as we drove. 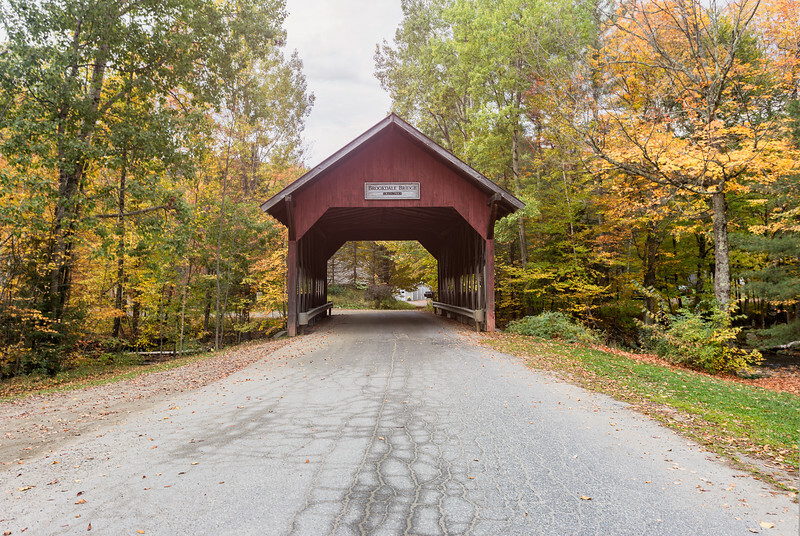 Our first pit stop - one of Vermont's famous covered bridges. The sky had turned a bit overcast so I focused on a simple composition with the road acting as a leading line going right down the middle of the image towards the bridge and beyond. The surrounding trees and leaves filled out the scene well. We continued on, meandering down dirt roads and stopping to gawk at alpine lookout points. One stop led to a fortuitous discovery: a sign proclaiming "Mill Trail to Waterfall". A waterfall in the middle of nowhere? Naturally we had to see for ourselves. We journeyed on foot past the sign into the woods, Lewis and Clark venturing into the great unknown searching for the Pacific. Turns out Bingham Falls is actually not so unknown and is in fact a popular local attraction. However we had taken the decidedly off the beaten path route. Instead of pulling off the highway and walking down to the falls from the parking lot, we were hiking through uneven slippery trails, clambering our way through. It was treacherous going, rife with jagged rocks and steep descents. We could hear the steady sound of running water gradually turning from a whisper to a roar as we hiked deeper into the forest. This wasn't Lewis and Clark, it was Hemingway hunting kudu in East Africa. We were stalking the waterfall (happily with cameras not rifles) and it was a dangerous business. A series of wrong turns almost ruined our expedition but we were able to scramble back onto the main path, our hearts thumping and my knees scraped. Finally, bumped and bruised and more than a little battered, we emerged through a clearing and found our reward. 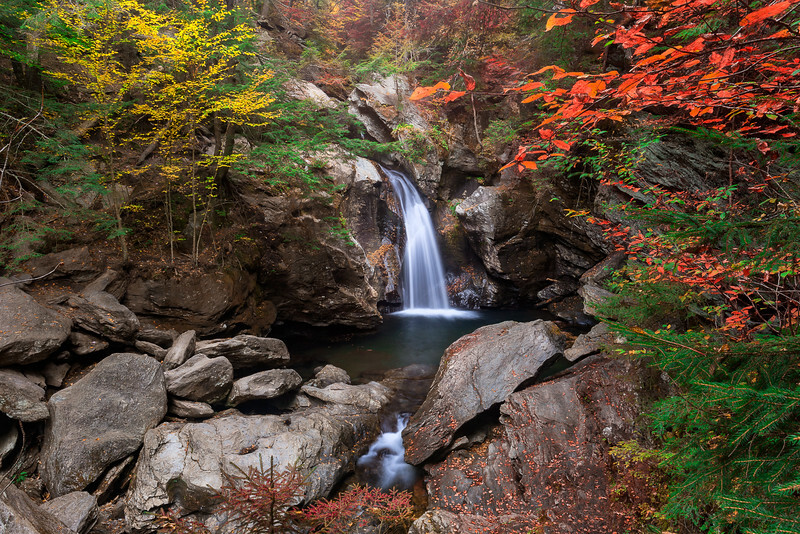 There she was, framed magnificently by a cacophony of color - our rogue waterfall. The key to this shot is a steady tripod. I dialed in a shutter speed of 4 seconds to achieve the smooth flowing look to the water. I combined this with a focus stacking method to ensure that the rest of the image was tack sharp, providing a pleasing contrast and a beautiful memento of a hard-earned prize. After an afternoon respite alongside the prettiest lake I've ever seen and a visit to a local Artisan Goods festival, we set out to find a good view of the sunset. Our options were endless and it seemed like each potential spot was better than the last. It was a veritable embarrassment of riches but we eventually ended up finding THE view. 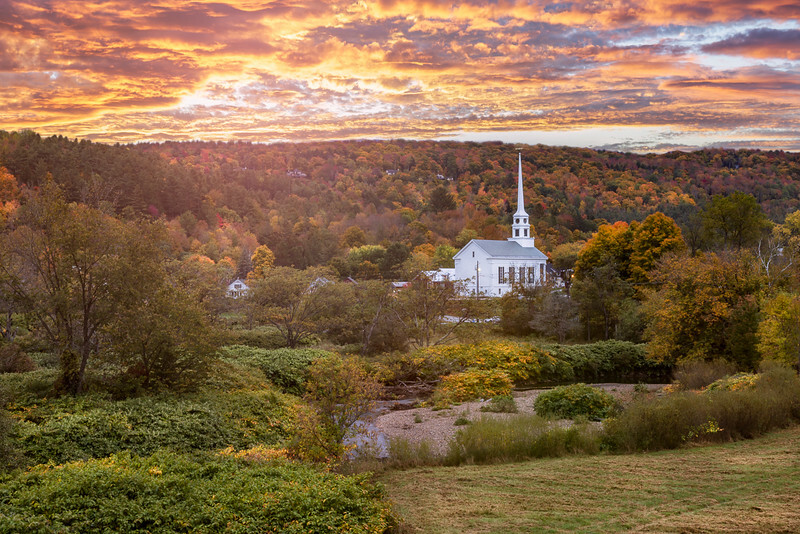 The sky exploded with color over the valley, the white steeple of the Stowe Community Church proudly jutting out over a vast tableau as far as the eye could see. It seemed like Nature was showing off just for us. We stood silently, marveling at the scene in front of us, the frenetic activity of our daily lives a distant memory. It was a picture-perfect moment of stillness. Stowe had stolen our hearts in a single day as we whole-heartedly embraced our temporary return to nature. I thought that quaint mountain villages could only be found in remote, far-flung places. But here in northern Vermont, we had stumbled upon a fairy tale set in the Swiss Alps. From sunrise to sunset we had feasted on a potpourri of pigments and hues. A final look over the town would have to last us for at least another year. It was a fittingly colorful end to a wonderful day of leaf peeping. Aneesh Kothari is a travel photographer and writer from Houston, TX. He loves Ben and Jerry's Ice Cream and can be found traveling the world with his wife, camera, and drone.